Warburtons have teamed up with the British Heart Foundation and their new packs are giving 5p from the sale of every loaf to the BHF. It is part of their pledge to raise £1million to help keep British families heart’s healthy. They are currently promoting the benefits of a healthy breakfast at the start of the day. 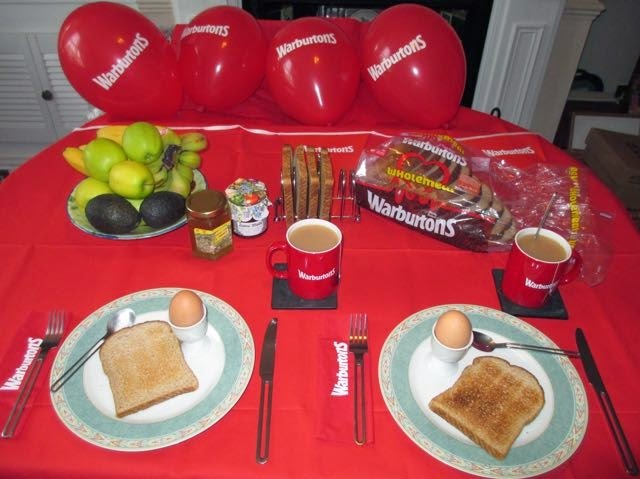 They sent us the lovely Big Red Breakfast Kit to inspire us to have a balanced tasty breakfast. We sat down to boiled eggs, toast with our homemade jam; one of the benefits of having several berry plants in the garden. We have blackcurrant, raspberries, gooseberries, rhubarb and various other goodies that get presevred each summer. I also had a favourite treat of mine, a toasted banana sandwich with a good drizzle of honey. My dad is a beekeeper, so we always eat plenty of honey. It is mostly healthy though, one of your five a day, some starchy carbohydrates from the bread and a little natural sweetness.